The Gurin Mid-Size Electric Dehumidifier uses thermo-electric Peltier technology instead of a compressor so it's light and quiet. It's 8.6 x 13.6 x 6.7 inches, so it's perfect for small rooms like bathrooms, closets, kitchens, and baby rooms. I've been using this dehumidifier on a tabletop in my downstairs laundry room. It's the perfect size and super quiet - way quieter than the old compressor dehumidifier we use by the sump pump. I leave it on pretty much 24/7 and after three or so weeks, it's still running great. The 52 ounce clear water tank fills up all the way about once a week in my laundry room, at which time the unit shuts off automatically and the red "full" light turns on. Emptying the tank is super easy too - Just pull it straight out by the handle, pull up on the plug on top of the tank, and hold upside down over a sink. 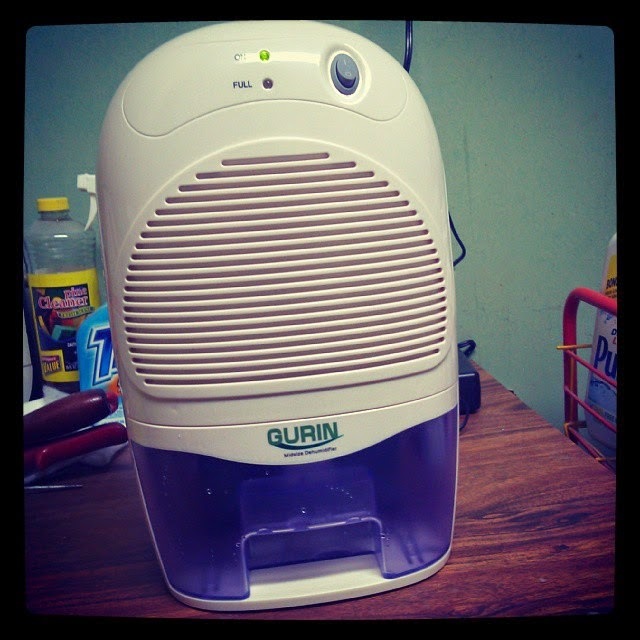 I actually didn't know dehumidifiers could be this quiet or easy! I love this little one, and during the winter I might try using it in my bathroom to keep things dry. It's light enough to carry from room to room, and the tank stays inside the unit until you pull it out, so there's no worry about the tank spilling or falling out while moving it. (Although I would recommend emptying the tank before moving the unit, just to be safe.) It also helps reduce odors, which is awesome in the laundry room where my cat's litter box resides. The dehumidifier has definitely helped make the room smell better. Overall, this is quiet, compact, and simple to use. It uses low energy consumption and shuts off automatically when full. I recommend a mid-size dehumidifier like this one for any room in your home.